This is a simple project- or at least it should be! The subtitle of this project should be: Sixth Time’s the Charm! I figured out lots of things you shouldn’t do when trying to cover a window shade. The first time I tried it involved a lot of trial and error, but the second time went very smoothly, once I had everything all figured out. Hopefully, I can provide you with some tips which I learned through my own experimentation so that this project will be very quick & easy for you. The windows in this spare bedroom looked OK, but I felt like they needed a little more personality and pizzazz. 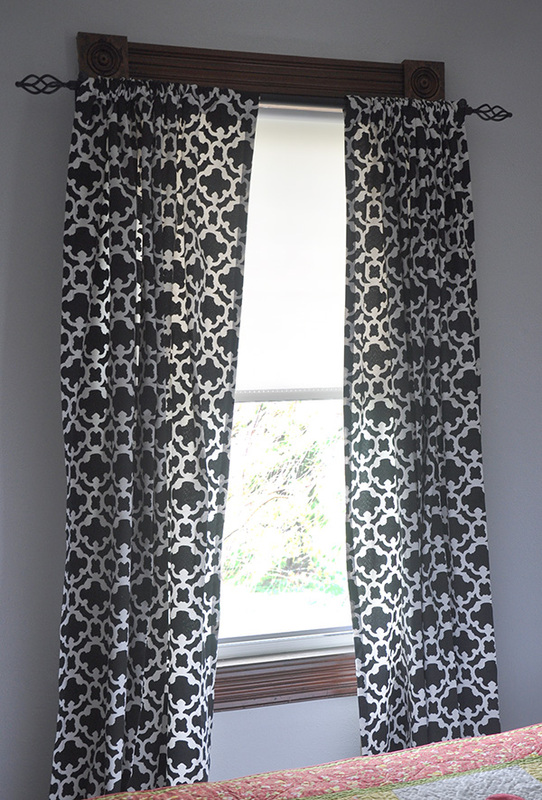 Before we begin the tutorial, let’s talk a little bit about fabric selection… The curtains that I had bought for the windows featured a large black & white geometric pattern. I needed something to brighten up the window and add some color. I also wanted something kind of soft and “curvy” to balance out the structured and “orderly” geometric pattern. Finally, the scale (in other words, the size of the pattern in the fabric) had to be small to medium in size so that it wouldn’t compete with or blend in with the large geometric pattern. 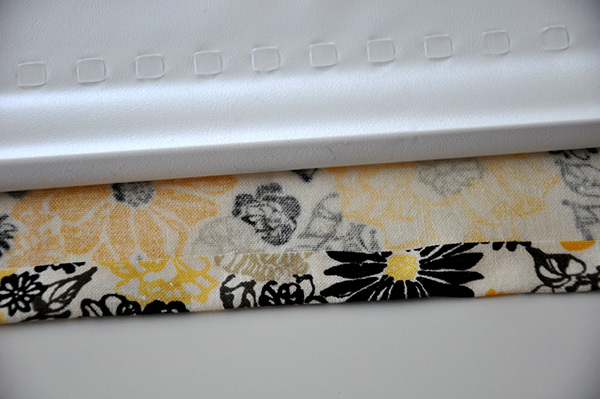 What I found was a medium scaled floral print in gray, black and yellow. The floral provided the “curviness” I was looking for, the scale complemented the curtains, and the pops of yellow brightened it up. Place fabric right side down on newspaper. 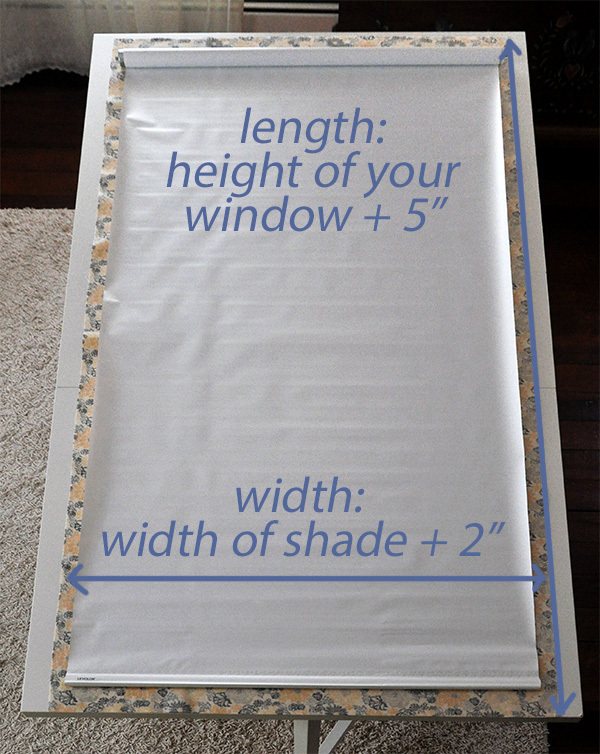 Place window shade on top of fabric, also with the right side down, so that the fabric is centered with about 1” of excess fabric on either side of the shade, and so that about 1 1/2” of fabric extends beyond the lower edge of the shade. Carefully put the folded portion of the shade back on the fabric, and smooth it down with your hands, working from center toward the edges, to work out any wrinkles. Fold back the other half of the shade and repeat. Flip shade over so that it is wrong side up again. 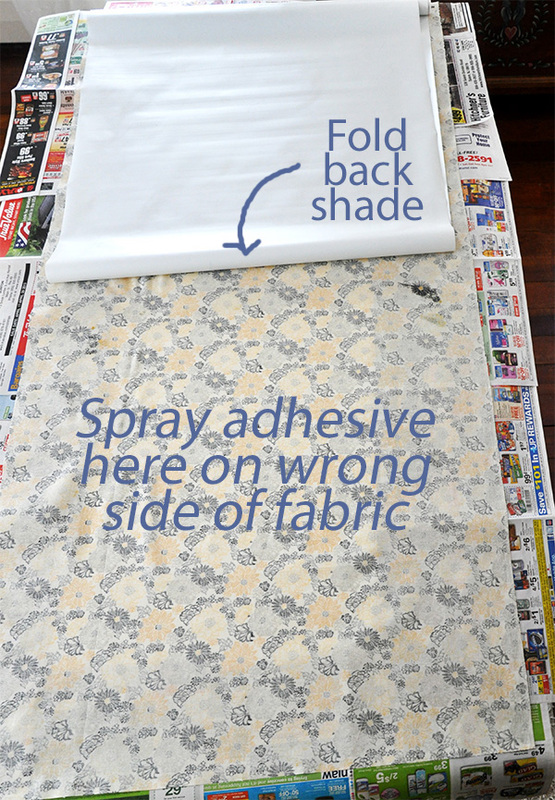 Place a generous line of tacky glue along long side edges of fabric and fold over edge of shade. Repeat with other side. 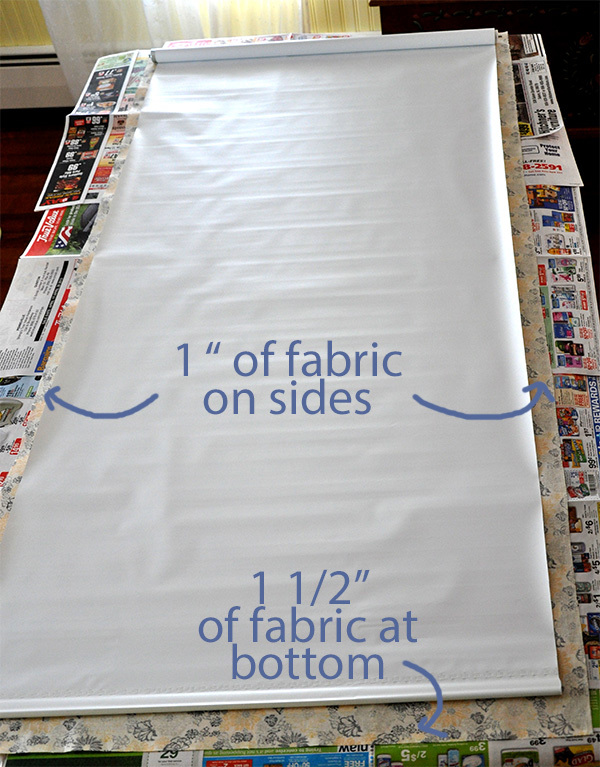 Glue down the side edges of fabric that extend below the shade, folding them toward the center slightly. 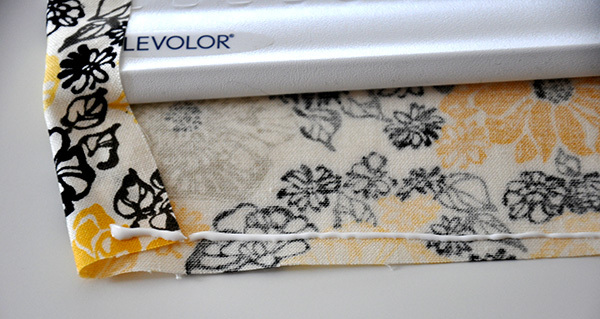 Place a line of tacky glue along bottom edge of fabric. 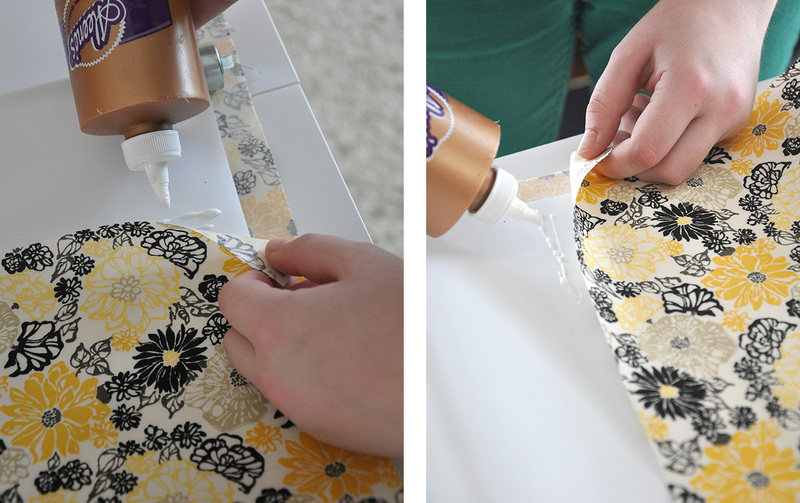 Place another line of glue along folded edge of fabric and fold over bottom edge of shade. Simple when you know what you’re doing, right? Doesn’t it add some extra interest to the window? 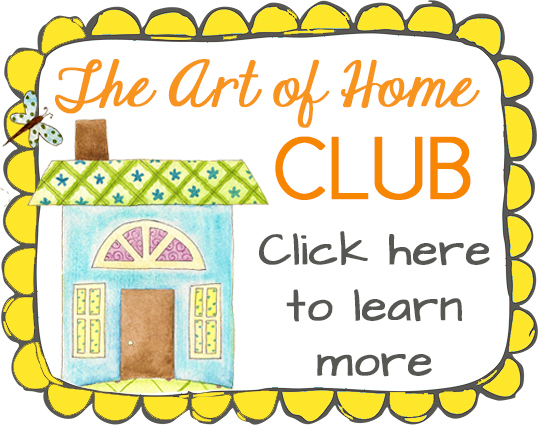 Also, if you liked this project, sign up for my FREE e-magazine and get more fabulous & easy craft, sewing & quilting projects, simple recipes, and so much more! (Yes, it’s totally free, no strings attached. And I NEVER sell or share your information.) 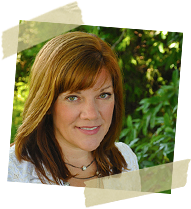 When you sign up, you will also get a copy of my emagazine, Simple Pleasures, which is for subscribers only. 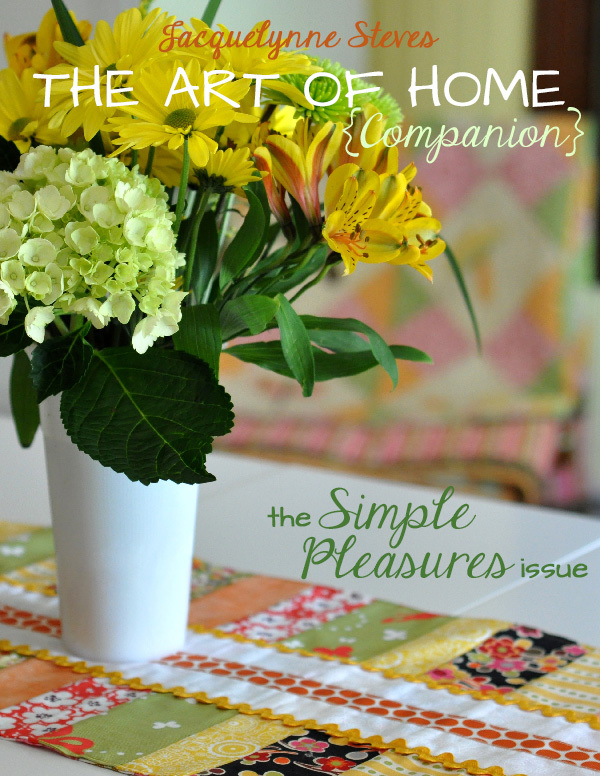 This article was posted in Crafts & DIY, Decorating, Featured, Tutorials. Bookmark the permalink. Follow comments with the RSS feed for this post.Post a Comment or leave a trackback: Trackback URL. Thanks, Tami. It really made a big difference in the room- it’s amazing how all those little details really give a room personality. Great idea so I bookmarked the page and i can reread it and try it out. Do you think you could cover both sides with fabric and glue the edges together so the shade could be unrolled as usual? I love this idea and plan on using it in two rooms! I’m not sure if you could cover both sides, the weight and bulk of the extra fabric might keep the spring mechanism from working to roll up the shade. You could put a valance at the top of your window so that the back side of the shade at the top wouldn’t show. 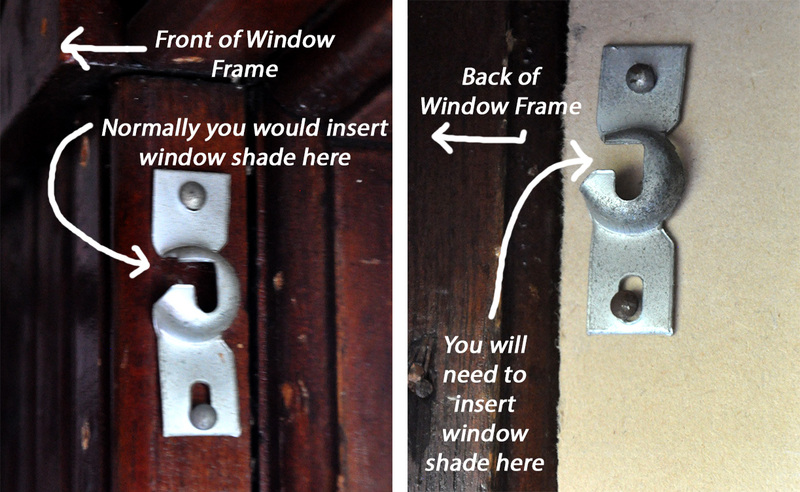 Here is an article about painting window shades. http://www.ehow.com/how_6352253_paint-vinyl-shades.html I have not tried this myself, and I wonder how regular paint would stick to vinyl shades? But if it works, you could paint the back of your shade a coordinating color- that would look pretty cool. If you decide to try it, please let us know how it works out! I have painted a vinyl shade with great success. I used craft paint you can get from any craft store. Loved it. I made some fabric shades many years ago. At the time I purchased some some fabric stiffener that was made especially for making fabric shades. My roommate and I had purchased bedspreads that were white background with orange polka dots and the rest of the room was so drab. I found an orange and white striped fabric and used the treatment to make the shades. I discarded the vinyl shade with the fabric shades. Was a fun project and was pleased with the results. Wonder if they still make the stiffener? Hi Carol! I’m not sure about the stiffener- I bought some several years ago, my bet is that they still do make it. Isn’t it amazing what you can do with some pretty fabric?? 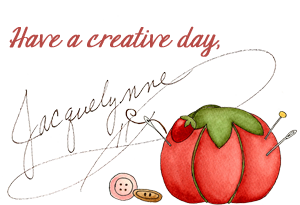 Just found your blog and love this tute! 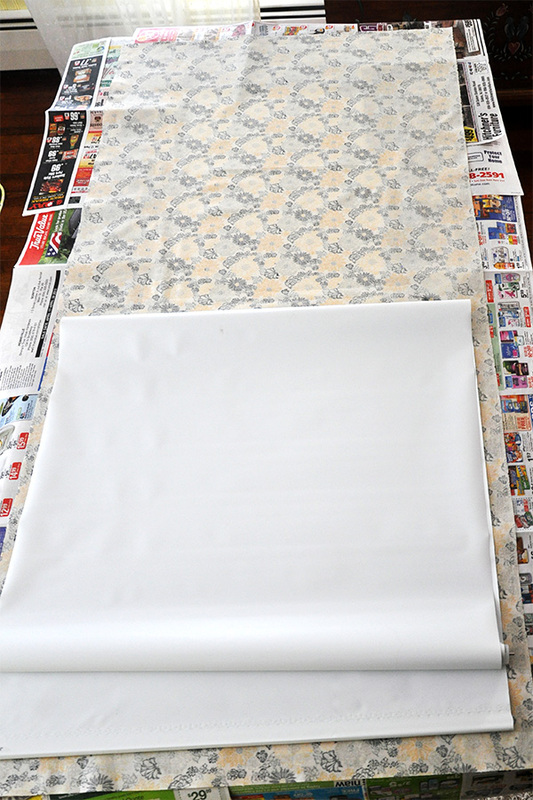 Think I’ll try this in flannel and have a design wall for my quilt blocks. Yes,I made the fabric shades with the stiffener as well, (many years ago). cheap looking vinyl has absolutely no curb appeal from the outside. Then I added a scallop and some fringe. I chose a medium weight(cotton) drapery fabric in a soft floral with a solid cream back. I wanted them to look good from both sides. I had them for over twelve years…time for some new ones! Yours are gorgeous! I love how the two different patterns compliment each other so well. You used starch, but that won’t replace the adhesive, right? You are saying that you stiffened the fabric with starch so that it would hang firmly. Without the extra weight of the shade, two pieces of common fabric can be used without risk of weighting down the shade mechanism. With that in mind, did you use adhesive at all? The fabric can be attached in way so that it can be taken down and washed, right? I have been trying to design fabric shades for a year now, but had a serious illness in my family that didn’t allow me to actually do the project. Cindy- I am a fan of Aleene’s Tacky Glue. You can also try a hot glue gun, but you have to be careful that it doesn’t melt the shade. gosh, I tried the Aleene’s tacky glue and it totally become unstuck after a few days. Not sure why? I never realised how easy it is to make curtains. Thanks for sharing this how-to! Your advice is great! Getting ready to try a window shade in my kitchen. Thanks!! Love this tutorial. 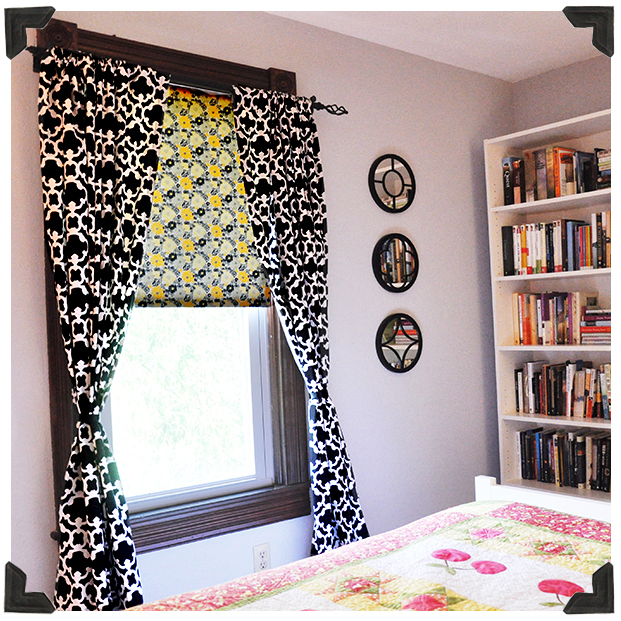 I did similar ones in the bedroom but cut the fabric flush to the shade, except for the bottom. Not as tight a gluing as I would like but I was afraid the wrap around would make it too thick for the shade to be rolled up and down a lot. They are beautiful and I’m sure I’m the only one who notices they aren’t perfect. I’m going to try the fold over method this time in the kitchen great room. Great work!! I will surely try this at my home, going to bookmark your page. Thanks for sharing it. I love it. I am having a perfect spot at my home to use it. Thank you for sharing post. Hope my room shades will look as beautiful as yours. After much internet research, I chose your instructions and tried this out. It worked perfectly. I covered 4 shades in my living room- bought the heavier cut-to-size ones from Home Depot and with a lighter weight fabric(not decorator) the spring mechanisms still hold the weight of the fabric and work perfectly. The first shade I did with fabric down- like you show, and I personally found it easier to do the rest with the shade down and glue the fabric on top- I found it easier to smooth out the fabric that way, and then I just flipped it over to glue the sides to the back. Also on the bottom, I folded the corners in, like when wrapping the sides of a present, before gluing up like you show. If you are thinking of trying this- go for it! It was not hard and they look so great. I saved hundreds of dollars over custom blinds/shades. Cynthia- I’m so happy you were pleased with the results! 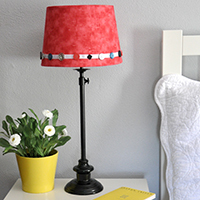 Isn’t it satisfying to make beautiful accessories for your home, and save money too! Fabric covered window shade is a very good way to enhance the beauty of the home. This technique will add value to the home. That’s a good looking fabric blind that you made. Fabrics make versatile materials for just about any home decor. Love it! Hi Celia. Thanks for your comment. To be honest, mine are in a spare bedroom so they don’t get used every day. So far, they seem to be holding up pretty well. They don’t roll all the way up to the top (due to the excess fabric bulk at the top) but they do roll up most of the way. Hope this helps! Nice tutorial. Is the finished product washable? Nice fabric! I love the look of roller blinds. If I weren’t renting right now I would do this to my place, but I think I would get in trouble. It adds so much to the room! I’m going to book mark this for future reference. Loved the transformation and the clarity of the instructions. I bought black-out blinds but wanted to add fabric for ages but wasn’t sure about how to go about it. 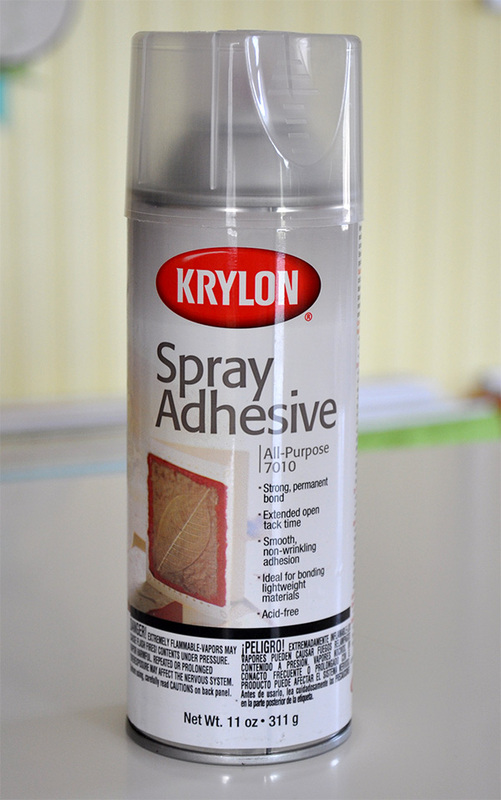 Could I use hi-tack PVA glue instead of spray; I’m concerned about the fumes in a bedroom. I would try the glue on a small section of the shade AND fabric first, to be sure it doesn’t melt or ruin the material. You would need to spread it on quite thinly, but since I haven’t used it, I can’t attest to how well it would work. If you are concerned about fumes, absolutely work outdoors with the spray, and let it air out for a good long while before bringing your finished project into your home. Hope this helps. These DIY blinds are amazing. Wish I was as talents as you are to create something this cool. Maybe one day I’ll get the hang out it. Thanks for sharing your DIY blinds with all of us. Hi Jacqueline, Thank you for the tutorial. Very easy to understand and chased away my fears. Many years ago my mother did this for her bedroom. It is gorgeous. Unfortunately she has dementia and can not remember the “how to’s” of it all. We are now redoing the living room and the windows desperately need help. New Victorian style furniture and Early American gaudy curtains aren’t making it. I wanted to do the shades and now I can get started. First project, find the right material. Is there any quality of fabric I should use. i.e. oil cloth, percale, cotton? Once again, thank you for the informative tutorial. cotton but I think it’s light enough that it would still work. Good luck! I just used your tutorial to repurpose 4 roller shades. I love the results! Thanks for adding in where you made mistakes – those comments helped me stay aware of which side I was gluing the fabric to. It was so much easier than I thought it was going to be. I have really enjoyed reading your page. your work is inspriing. I wish to glue a black out lining to a piece of fabric and make my blind from scratch. Can you recommend a blackout lining which i should use or do you think it will all be too heavy. i’m aiming to reproduce a Laura ashley blind. your covered shades are remarkably easy to do with your perfect instructions. Will be doing an extremely tiny, 14″wide, bathroom inside mount shade tomorrow. But they look wonderful and all the the tips helped make it less painful although I did get the glue all over myself and the newspapers I did rubbed off the black on my hands and knees… lol but otherwise all good! Jacquelynne, Thank you so much for this great tutorial! completed the project 2 days ago and was delighted with the results. I am hoping to complete two more today. I actually ended up doing it on the driveway to keep the fumes out of the house. Great project and just what I was looking for. Telling us about your mistakes really helped as well. I am concerned that the thickness/weight of the fabric might interfere with the proper function of pull up spring mechanism. Contemplating using a flannel fabric. Thanks, I will be working on this tomorrow. Your tutorial is great in that it shows you which way to hang the shade.